I LOVE this trailer created by Imaginary Forces for Paul Rand's posthumous induction into The One Club's Hall of Fame in 2007. Paul Rand Retrospective from Jeremy Cox on Vimeo. BRAVO! Did you like it? 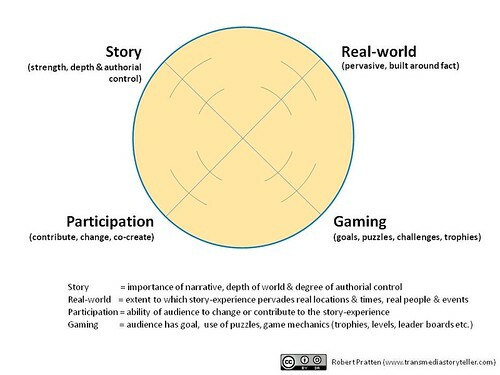 If you are a visual learner like me, and enjoy mapping information, Robert Pratten/ZEN FILMS has some great diagrams explaining THE TRANSMEDIA EXPERIENCE on his flickr site here. The MIT Sandbox Summit 2011 is right around the corner, April 28-29. Confirmed speakers and presenters include: Brendon Boyle from Ideo, Wendy Bronfin from B & N, Sara Dewitt from PBS and Carla Engelbrecht Fisher, a game designer & researcher. You can see the full list here. Listen to the keynote from last year: "TOYING WITH TRANSMEDIA: THE FUTURE OF ENTERTAINMENT IS CHILD'S PLAY" by Henry Jenkins. Find out more about the SANDBOX SUMMIT 2011 here. Are you going? Looks great, especially with all the gamification BUZZ whirling around these days. "65% of young people are creating media." Check out his presentation and the panel comments at POWER TO THE PIXEL. Well worth watching if you are ready to pitch. There are some good ideas and constructive comments from Saneel Radia from BBH Labs, Marc Goodchild BBC, Matt Locke from Channel 4, Nuno Bernardo from beActive and Judy Adair from Disney on how to move a kids brand forward. More transmedia food for thought. Here's an older presentation by Leo Rayman from January 2010. 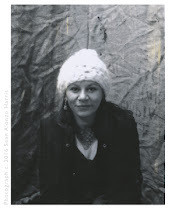 TRANSMEDIA NARRATIVES: FACT OR FICTION? Direct Action Games: Games Meet The Real World from Games for Change on Vimeo. Read the Henry Jenkins article: Akokha-A Direct Action Game? here. Jane McGonigal Interview with Games for Change from Games for Change on Vimeo. Take a look at this Game Mechanics Primer by Amy Jo Kim featured on GOOGLE TECH TALKS. Amy Jo Kim is the Co-founder of ShuffleBrain. What is ShuffleBrain? "ShuffleBrain is building smart games for a connected world." They're "Passionate about creating personalized, lightweight,socially connected games that keep you sharp." 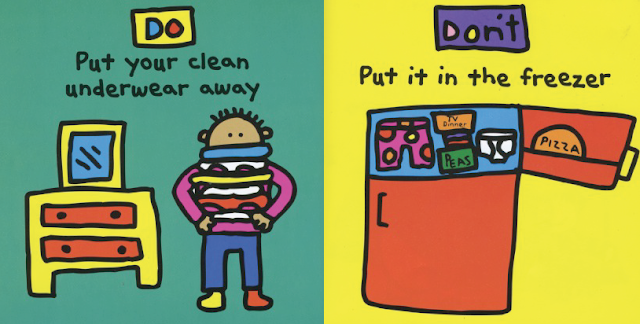 I LOVE TODD PARR! His zany characters and simple message exist in the most colorful FUN PACKED world. I want to live there! I can't count how time many times I have given this book away. Event to adults! Kids always giggle knowing it's a FUNNY & ODD for an adult to be talking about UNDERWEAR! But that is the power of TODD PARR, in his colorful safe world, he can talk about anything. Here are a few spread of the book UNDERWEAR DO'S & DON'TS, published by MEGAN TINGLEY BOOKS, Little Brown & Company. Check out his Sesame Street video. The voices are really GREAT. Voice plays a huge part in animation. APP developers should take this to heart. The APP for UNDERWEAR DO'S AND DON'TS falls short in translation of this great KIDS IP. I would have liked to see something between the book and the animated short in quality. I think the APP experience could have been improved with more attention to detail. DON'T RUSH It looks like the APP was produced quickly with very little attention to the details that can make a big difference in APP experience. VOICE I think a kids voice would be more powerful than an adult voice. Not sure if that is Todd in the voice over. I think the voice in the Sesame Street video is perfect! NAVIGATION BUTTONS The buttons on this APP are designed using pastel colors. WHAT! Just looking at his art, you could see endless possibilities for a FUN COLORFUL user interface. This was major FAIL. TEXT BOX This is another design fail, in my opinion. Perhaps the APP developer, didn't have a design budget? Or didn't take the time to design something specific for TODDS ART. Placing the text over a white screened background just doesn't work. It's annoying and masks the illustration. Whatever the reasons, it is the simple details that make a great APP experience. On the other hand, THUMB ARCADE, created a really SILLY, FUN game experience for the book UNDERWEAR DO'S AND DON'TS. Everything about it screams TODD PARR, and extends the TODD PARR STORYWORLD with games. I especially like the underwear eating monster! It made me laugh. They did a really great job at extending the TODD PARR STORYWORLD. 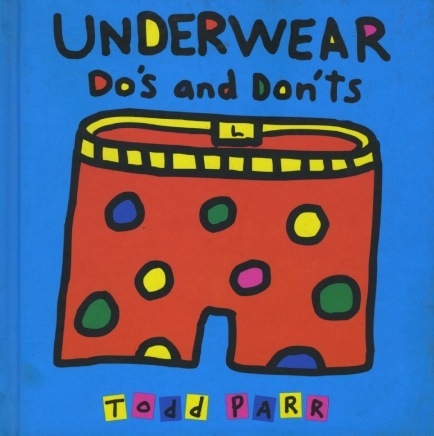 By the way, TODD PARR books are also available on iBooks and NOOk color too. You can find the trailer for the game here on TODDPARR.COM. 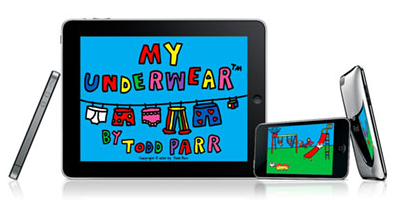 Find MY UNDERWEAR in the APP store here. Check out TODD WORLD here.